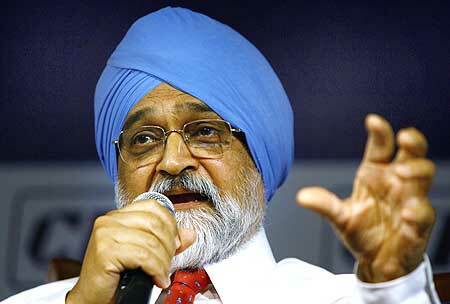 Planning Commission deputy chairman Montek Singh Ahluwalia has said that the government may have misjudged the rends in inflation by expecting it to moderate earlier adding that if the prices remain high, it would hurt the government’s credibility. "It is true inflationary pressure is higher than we had thought it would be... It's absolutely true we have been hoping that this would happen earlier and to that extent our credibility becomes questioned," Ahluwalia said. He also said that the government is still expecting the inflation to ease in the coming year. It is hoping that the inflation will fall to 7-7.5% by March next year. He expressed that if here is mo moderation in inflation in the month of January then the government’s plan would be questioned. The inflation will come down to 7-7.5% by March next year. Inflation has remained high all this year and the RBI has increased its benchmark interest rates 13 times since march of 2010 to control inflation. Some believe that the RBI’s rigid stance and stubborn inflation has hurt the growth in the India economy. Meanwhile, He has said on Friday that he expects the Indian economy to grow between 7.6 to 8 per cent in the current financial year. While speaking on the sidelines of an event organized by FICCI, he said that even at the rate of 7.6 per cent, the Indian economy is growing at a speed unmatched in the world. He rubbished suggestions from the industry circles that the increasing of interest rates by the RBI has affected economic growth by saying that the interest rates stand at a level similar to when the economy was registering a growth of 9 per cent.